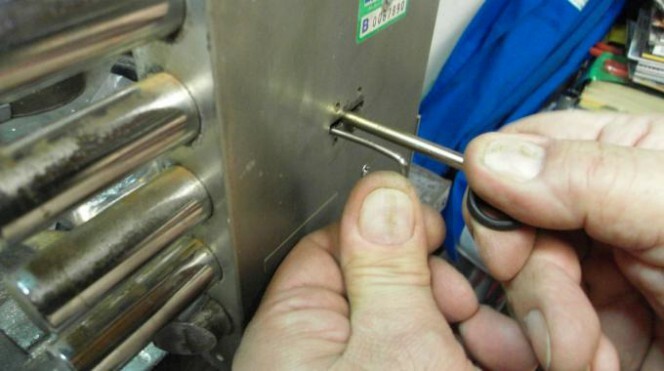 Whilst it is true that there are a number of techniques which allow locks to be opened without a key and without breaking them, it is also true that there are types of locks which are particularly vulnerable to certain techniques. The good news is that there is no single technique which can open all locks … on the contrary, different locks require different break-in techniques. As we have seen, the two main types of locks on our main doors, especially on armoured doors, are double-bit locksand European cylinder locks. Both have strengths and weaknesses that one needs to know in order to make the best choice. Let’s start with the double bit locks. What are their weaknesses? Many cases reported in the newspapers in which thieves are able to “magically” open “all types of locks” actually refer to gangs specialised in opening double bit locks using the so-called “Bulgarian pick”, a burglary tool coming from Eastern Europe (hence the name), which, when inserted in the lock, allows the shape of the original key to be reconstructed and, therefore, the door opened with relative ease. In order to deal with this threat the manufacturers have created a new generation of locks with systems for protecting against the Bulgarian pick. So if you choose to install a double bit lock it is important to ensure that it is of this type. Unfortunately, the thieves continue to hone their skills in making modified picks for double bit locks, in the continuous attempt to overcome the countermeasures adopted by manufacturers. All the double bit lock models suffer from an inherent weakness. The double bit key has an enlargement at the base, so the lock must have a much wider slot for insertion of the key compared with that for a cylinder lock. This makes it much easier to introduce burglary tools or to manipulate inside the lock. 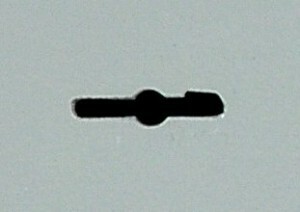 The slot for inserting a double bit key is very wide. Traditional double bit keys are quite easy to copy; often, just a photo, a photocopy of the key or an imprint on a wax tablet would be sufficient, to act as a model for machining a key blank. For this reason, more complex double bit locks are also produced, operated by patented keys fitted with further elements, so that copying is controlled. 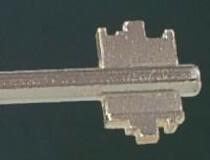 The profile of a double bit key is easily copied. These are basically the reasons why the popularity of double bit locks has suffered a severe blow in recent years and, unlike what happened in the past, new armoured doors typically use European cylinder locks. Key bumping represents for European cylinder locks what the Bulgarian pick is for double bit locks: in some cases it allows the lock to be opened without breaking them, and in a relatively easy manner. However, because of the way double bit locks are manufactured, they cannot be opened with the key bumping method. 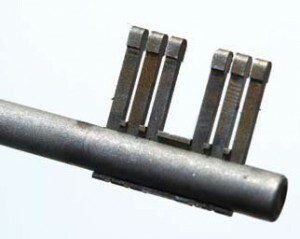 A pin type lock, such as those with a European cylinder, can be attacked using a drill, both on the plug (rotor), to remove it, and on the body, to release the springs and pins. This is not possible on a double bit lock, which can be only attacked using a very large cutting device, that could basically remove most of the lock, which, however, unlike the cylinder, is located inside the door, which is often an armoured door. Thanks to their size, double bit locks can be easily motorised. The motorisation has several advantages, the main one being the possibility to automatically trip the throws of the lock every time the door is closed. In this way you can be sure that the lock is always closed, avoiding the risk that they can remain open because one is in a hurry or distracted. With all locks, they have their weaknesses. Some of the best locks even have weaknesses, which causes the potential burglar to spend a lot of time trying to get in. Even though this type of lock isn’t that secure when compared to others, I think that the newer types are much better than the older ones.